Xiaomi has introduced Redmi 4 (4X China) in India which comes with Octa Core processor, Fingerprint Scanner. 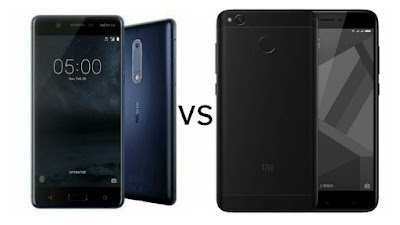 Check out Price, Specs, features comparison between Nokia 5 and Xiaomi Redmi 4. Nokia 5 comes with a 5.2-inch (1280 x 720 pixels) 2.5D curved glass display with Corning Gorilla Glass 3 protection whereas Redmi 4 comes in 5-inch (1280 x 720 pixels) HD 2.5D curved glass display. Both Phones has Fingerprint Scanner. Both Phones support Dual SIM Support, Nokia 5 has Dedicated MicroSD card slot. Nokia 5 is powered by 1.4 GHz Octa-core Qualcomm Snapdragon 430 processor whereas Redmi 4 has a 1.4 GHz Octa-core Qualcomm Snapdragon 435 processor both has similar performance.Nokia 5 runs on Android 7.1.1 and will get Android O update whereas as Redmi 4 runs on Marshmallow and will be updated to Nougat. Redmi 4 is packed with a 4100mAh Battery whereas Nokia 5 has lower 3000mAh Battery.